Tenancy Set up fee is a fixed-cost fee that can cover a variety of works depending on each tenancy, including but not limited to conducting viewings, negotiating the tenancy, undertaking Right to Rent checks and drawing up contracts. It is charged on an individual property basis – not per tenant. Referencing Fee is a fixed-cost fee that covers all aspects of referencing each individual tenant, including but not limited to obtaining work and landlord references and credit history/checks. It is charged to each individual tenant being referenced. Tenancy Set Up Fee: £156 incl VAT per property & referencing fee of £60 incl VAT per tenant. Tenancy Set Up Fee: £216 incl VAT per property & referencing fee of £60 incl VAT per tenant. We will require a Reservation Fee of £800 as confirmation of your intent to proceed with the proposed tenancy. This will be put towards your first rental payment and is NOT REFUNDABLE SHOULD THE APPLICANT a) subsequently withdraw, b) make any false claim in regards employment/reference status, or c) the commencement date is delayed by you. However, if the Landlord via his/her agent, decides not to proceed for any other reason, then we will return your money in full. If you wish to terminate your tenancy prior to the end of your contract, and the landlord agrees to this, you will be responsible for the repayment of the pro-rata commission paid in advance by the landlord to the agent for the unexpired portion of the tenancy, unless you are leaving as per the break clause in your contract. If you wish to change the identity of the tenants, and the landlord agrees to this, we will need to take up references on the proposed tenant(s) and, if suitable, draw up a new contract. We will charge a tenancy set up fee of £216 inclusive of VAT per property together with a referencing fee of £60 inclusive of VAT per tenant for this. For our managed properties there is no fee for renewal of tenancy. For non-managed properties, if you wish to extend/renew your tenancy, a charge of £216 incl VAT will be charged. The first installment of rent must be paid in cleared funds prior to keys being released for you tenancy. The subsequent rent payments should arrive on the due date by cheque, cash or standing order. For managed properties, one rent should be paid each month and we will not accept multiple payments. If you pay the rent late, we can charge you interest at the rate of 3% a year above the Bank of England base rate once the rent is 14 days late. We will charge you interest until the date we receive full payment. Capital Properties Management Ltd will take up references based on the details you supply. We will require photographic ID in the form of a Passport or Driving Licence for all applicants. In addition, with effect from 01/02/2016, following the introduction of the Immigration Act 2014, anyone from outside of the E.E.C. (European Economic Community) must provide proof of their visa status and checks will be carried out against this, these may involve checks with the Home Office. Periodic visa checks may be made after a tenancy has commenced. All these references/documents may be passed to your Landlord. A deposit equivalent to 6 week's rent must be paid in cleared funds prior to keys being released for your tenancy. 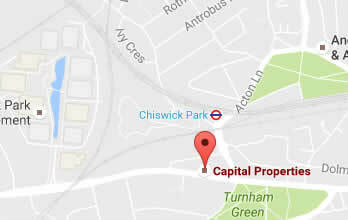 Where Capital Properties Management Ltd holds the deposit we will hold it as Stakeholder in a designated Client Account. We will not pay any interest on deposits held. For non-managed properties, the deposit will be passed to your landlord and he/she will be responsible for protecting it under one of the Government Authorised Deposit Schemes. The landlord will be responsible for the cost of the preparation of the inventory and check-in and the tenant will be liable for the cost of the check-out. The cost of an end of tenancy inventory check-out by an independent company is in the region of £165 incl VAT for 1 to 3 bedroom properties to £235 incl VAT for 4 bedrooms and above. However, from time to time charges may vary, please enquire for specific charges when you tender your notice. Please ask for specific charges when you tender your notice. For non managed properties the cost of an end of tenancy inventory check-out is £165 incl VAT for 1 to 3 bedroom properties and £235 incl VAT for 4 bedrooms and above.